15 piece clear stamp set. Two men in a boat fishing, a dog lounging on a floaty, jumping fish, fish in a bucket, and awesome sentiments: "May all your fishes come true. ", "Hope your day is fin-tastic! ", "Good things come to those who bait. 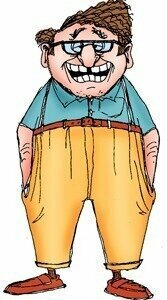 ", "Hope your day is reel-y great! ", "Best fishes for a happy birthday", "Reel great guy! ", "Gone fishing! ", "To a reel catch! ", "Reeling in the big one time to celebrate! ", "O-fish-ally over the hill!". Customize this two story house stamp with matching shutters and dies that cuts and scores doors and windows! Includes a 4 piece clear stamp set including sentiment "The road to a friends house is never long!". 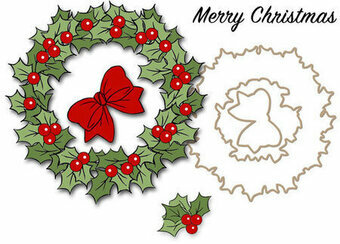 Includes 7 piece die set. 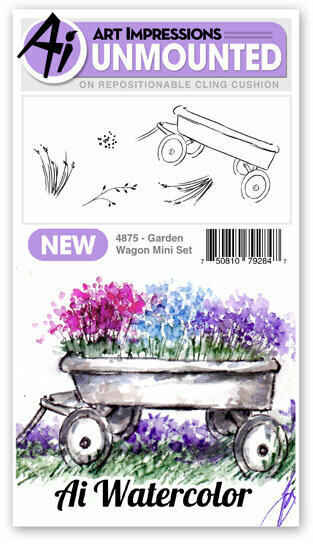 This new WC Mini Set includes a wagon, two wild grasses facing opposing directions, simple vine and teeny flower bunch. 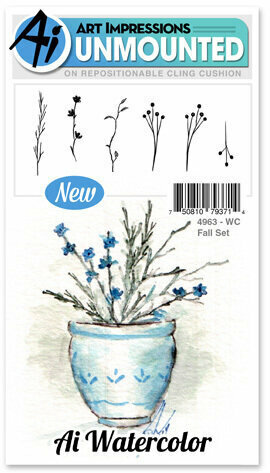 ***Colored image on the packaging is for inspiration and may use stamps from other sets. The stamps included are the black silhouette/outline images. 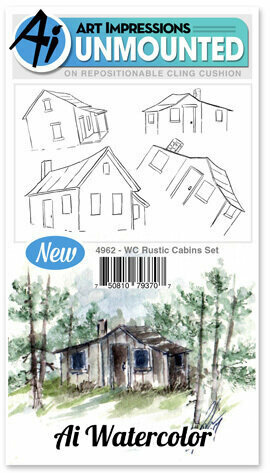 Four cabin horses to mix and match in your watercolor scenes. Berries and twigs to mix and match in your watercolor scenes, perfect for autumn. Set of 6. 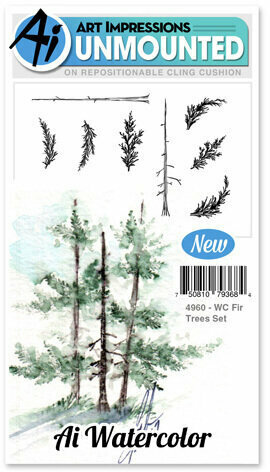 Two tree trunks and six pine needle boughs to customize your own trees in your watercolor scenes. Set of 8. Four new and unique containers! Includes, wooden crate, wooden barrel, cowboy boot, and tree stump. 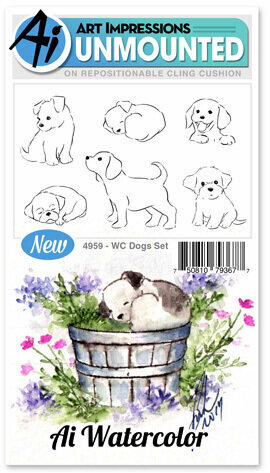 ***Colored image on the packaging is for inspiration and may use stamps from other sets. The stamps included are the black images. 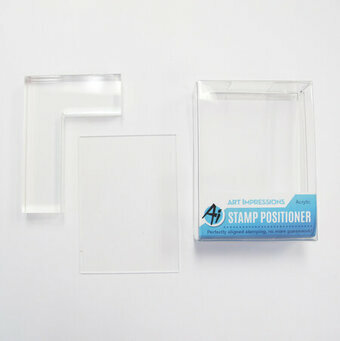 A 2.5″ x 3.5″ L shaped acrylic and rectangular piece perfect for aligning your stamps. 1) Align square with positioner, stamp image on top left of acrylic sheet. 2) remove square and place acrylic sheet with image to desired location. 3) Return posotioner to original locations, remove acrylic sheet, and stamp image. 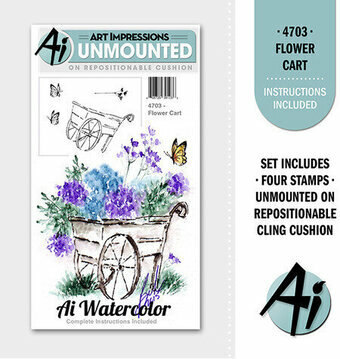 Watercolor Mini Unmounted Rubber Stamps from Art Impressions featuring a Flower Cart. 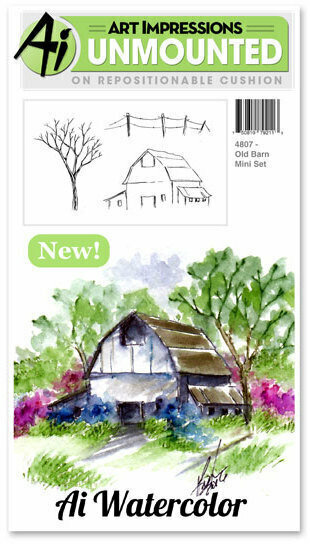 This Watercolor Mini Project Series Set includes an old barn, bare tree and a fence. Set of 3. 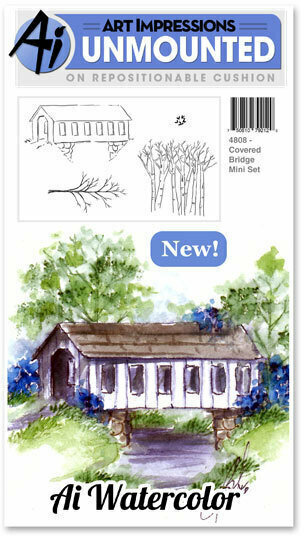 This Watercolor Mini Project Series Set includes a covered bridge structure, a single tree, a row of birch trees and tiny leaves. Set of 4. This "Girlfriends 2015" stamp from Art Impressions includes 1 stamp unmounted on repositionable cling cushion. This stamp features the sentiment "We get by with a little help from our friends". This "Girlfriends 2015" stamp from Art Impressions includes 1 stamp unmounted on repositionable cling cushion. This stamp features the sentiment "May your bobbin never be empty". This "Girlfriends 2015" stamp from Art Impressions includes 1 stamp unmounted on repositionable cling cushion. This stamp features 4 friends. Blanche is ready for the beach with swim ring and flippers. This set of unmounted stamps from Art Impressions features a Dad, and the phrase "To the Grillfather... you're my hero". 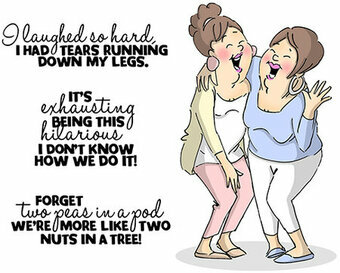 Part of the Girlfriends 2014 release from Art Impressions, this set of unmounted stamps features 2 friends, "Forget two peas in a pod, we're more like two nuts in a tree", "I laughed so hard I had tears running down my legs", and "It's exhausting being this hilarious, I don't know how we do it". This set of unmounted stamps from Art Impressions features a man with a tool belt, and the phrase "To my weekend warrior... you're my hero". 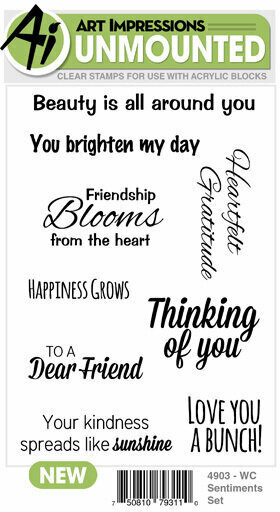 This set of unmounted stamps from Art Impressions includes 2 friends enjoying coffee, and the phrases "Coffee with you is my favorite perk", and "You always keep me grounded". Part of the Girlfriends 2014 release from Art Impressions, this unmounted stamp features 3 friends enjoying a glass of wine. 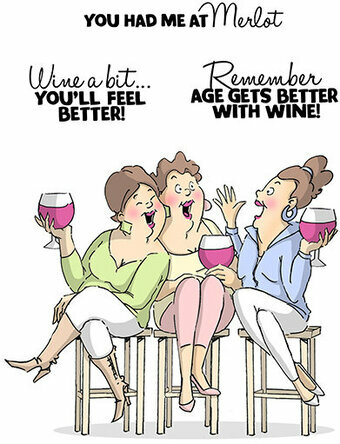 Part of the Girlfriends 2014 release from Art Impressions, this set of unmounted stamps features 3 friends enjoying a glass of wine, "You had me at Merlot", "Wine a bit... you'll feel better", and "Remember age gets better with wine". 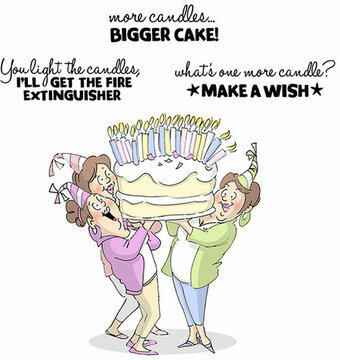 Part of the Girlfriends 2014 release from Art Impressions, this set of unmounted stamps features 3 friends holding a large cake with candles, "More candles... bigger cake", "You light the candles, I'll get the fire extinguisher", and "What's one more candle? Make a wish". This gal is a real hoot!